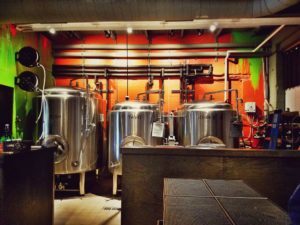 Ann Arbor has long been a hotbed of craft brewing activity in southeastern Michigan. Between Arbor Brewing, Grizzly Peak, Jolly Pumpkin and several others, you don’t have to travel far to find a quality tap room or brewpub to satisfy almost any thirsty soul. 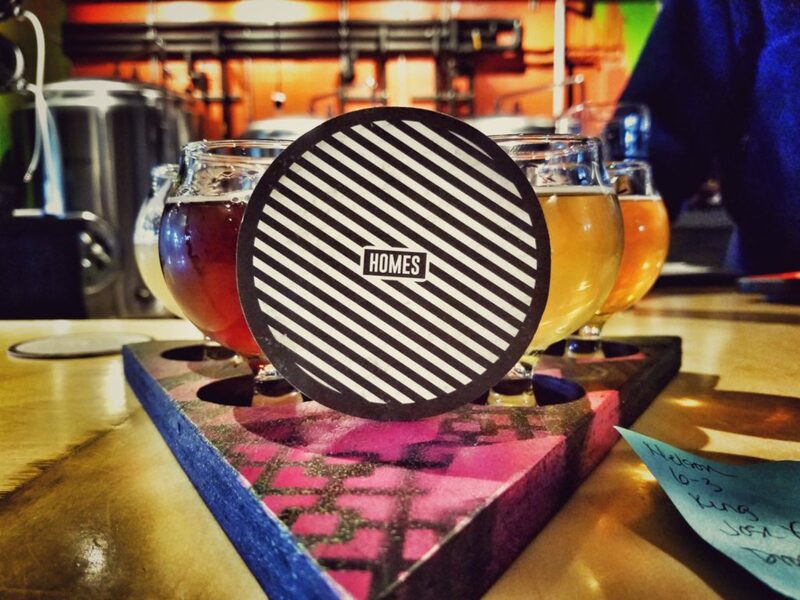 It’s time to add HOMES brewery to that list of quality stops, and this one was definitely worth the wait. Although I came for the beer (and I’ll get to that in a second), the first thing that caught my eye was the overall design. 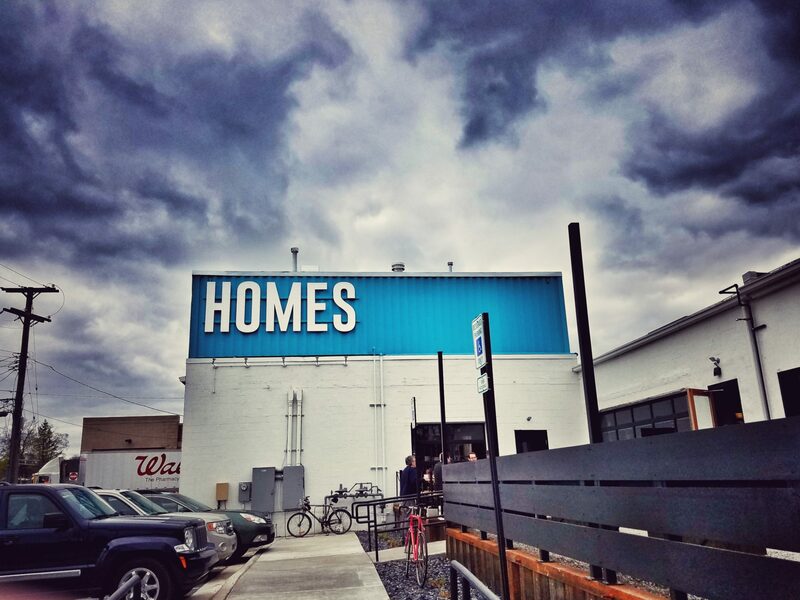 HOMES has neo-industrial look, full of clean lines and bright colors. It feels like a post-post apocalyptic world where the machines have already claimed victory. Where the bodies have been burned, the ash has been scattered, the viscera has been cleaned and rubble has been wiped away – but they’ve unknowingly left us this one bastion. A source of light where the beer, the food and the design bring us together to overthrow the machines and we cruise into the sunset driving neon colored Ferrari Testerossas. But you’re here for the beer right? So let’s get on with it, shall we? Sincerely, Nelson- A smooth Pale Ale that has a citrusy-grapefruit aftertaste. They describe it as having white wine characteristics but I only faintly picked that out. 6 Languages 3 Voices – An Oatmeal Stout with chocolate and coffee flavors. I was happy that it didn’t have a boozy aftertaste, which I’ve found does pop up in some stouts – not here. This is a quality Oatmeal Stout. King Cold Brew – Imperial Cream Ale – I’ll be honest – I was expecting a darker beer. It was dark yellow, slightly amber in color with a strong coffee aroma. It’s sweet but not overpowering, and has a great coffee taste upfront to go with that great smell. It’s 8.4%, but this is easily my favorite, and very dangerous. If you like Oddside’s Bean Flicker, you’ll like this. I think King Cold Brew is the better of the two and not quite as sweet. This one can definitely sneak up on you. Jose Extravaganza – A Red IPA – I don’t know if I’ve ever had a red IPA before. This is nice and hoppy, piney, and with a slight caramel flavor. I really enjoyed it, it felt like it brought together the best of both words between an IPA and an Amber. Drops – A Sweety Drop Gose – Alright, gonna come clean here… I have no idea what a gose is, (I know, I’m so behind the times) but what I tasted was kind of reminiscent of wine, a little sweet, salty and sour. I know I need to step up my sour game, but this one may have opened some doors into that world for me. Same Same Different – IPA – This is super bright and with a strong grapefruit taste. It was refreshingly hoppy but not too bitter with a nice hazy yellow color. Everything I tried was either a good example of the style, or it flat out blew me away. I don’t think there’s a bad choice on the menu. Nick Panchamé (formerly the head brewer of Right Brain) is the mastermind behind these brews, so I’m not surprised at how much I liked everything. Now that Nick is nearby, I’m looking forward to checking out his work more often. Besides great beer, HOMES also has a distinct food menu that consists of asian street food. I had tariyaki chicken wings and a Korean beef bowl that was nothing short of amazing. I’ll be coming back to try some of the other choices from the food menu soon. It’s nice to see that a place like this with great design, and great beer can also deliver on some great food and serve as a one stop shop for a night out alone or with a group of friends. If beer isn’t your thing, spirits and mixed drinks are available too. While the brewery was only open to the public for a day before my visit, they seemed to have their service in check. There was no table service, so as I’d expect with a newly opened business there were lines for food and beer. Even with the lines, everything moved quickly and all the staff I talked to were committed to making sure that I was being taken care of. Despite it being pretty chaotic at times in there, all of the staff seemed laid back and everything was under control. The beer and food came out quick, and I was really impressed that it’s been open for only a short time but it already felt like they had it all together and running with near clockwork precision. Our inevitable future controlled by machines and AI is a scary place, and the crack of skulls underneath their clawed chrome feet is chilling. But, don’t be afraid, your neon Testerossa awaits you at HOMES.